Variety is the spice of life, as the saying goes. So it was a nice to be asked to turn something non-bowl shaped recently. A friend of mine had come in to possession of an old beer barrel with a wooden tap. A dog with an obvious liking for something malty had enjoyed chewing on the tap, so the tap came home with me and sat on a shelf until I had a chance to see if I could duplicate it, more or less. 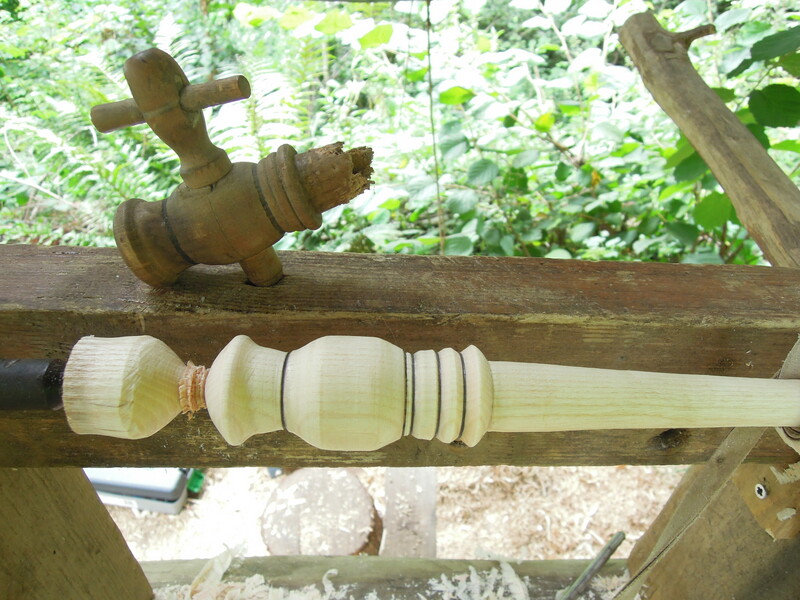 I haven’t done any spindle turning as such since getting into pole lathe turning. In fact the only time i have used standard turning chisels has been when turning the mandrels (drive shafts) for bowl turning. So I explained that I wouldn’t be able to produce an exact copy but would try to get somewhere close to the original. I split a billet of seasoned ash and used a shave horse and draw knife to get it ready for the lathe. I then made a few adjustments to my bowl lathe tool rest, getting the rest closer to the metal centers and higher than I have for turning bowls. And off I went with gouge, chisels and skew chisel and my trusty left leg doing it’s rhythm thing. Above you can see the original chewed tap and below it, still mounted on the lathe, my attempt at a copy…and my first ever attempt at this type of spindle turning. It was interesting to learn how the skew chisel works and I really enjoyed the challenge. The agreement was to get the blank turned and then give the piece back to my friend who would finish it off by drilling a hole along the inside length of the previously chewed section, and another hole in the side to accommodate the wooden tap. 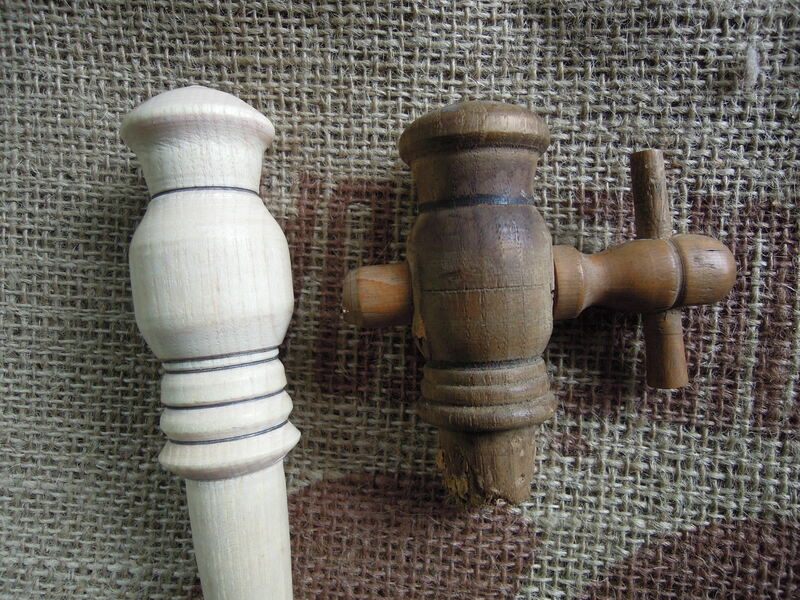 You can see below that the tap is turned from a different type of wood, much harder, (box?). I noticed that the hole in the side of the ash piece is actually a square shape which had a piece of cork fitted to ensure a tight seal with the tap. I would be very interested to hear from anyone who knows anything else about this type of wooden tap. 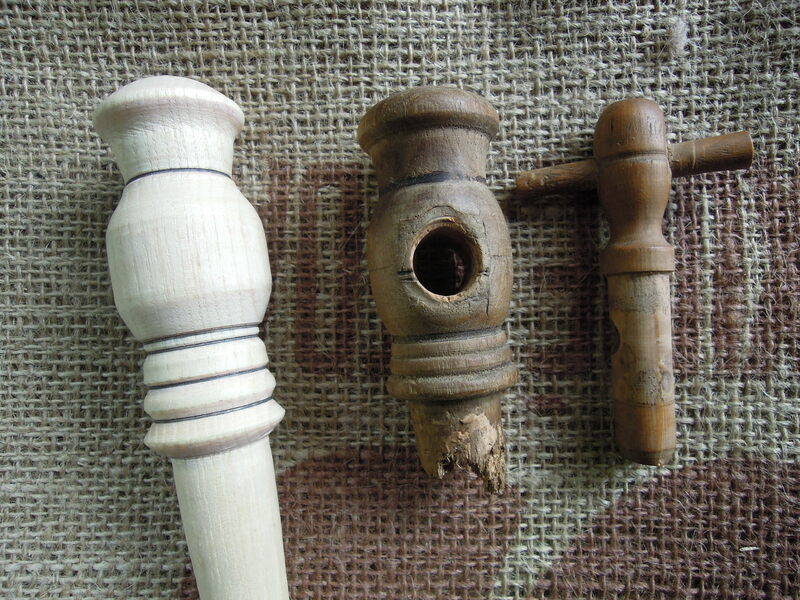 It’s a lovely old piece of functional turning and I would love to know more, specifically about the cork seal.